Many German freighters were serving as supply ships for the Kriegsmarine during WWII, and Welheim was one this ships. Built-in 1939, Welheim was equipped with a modern diesel engine. On November 28th, 1944, Welheim was on her way to Ålesund loaded with coal when she was attacked by the Norwegian MTB-717. After being hit by a torpedo, the 135-meter long freighter was doomed and sank after a few hours. 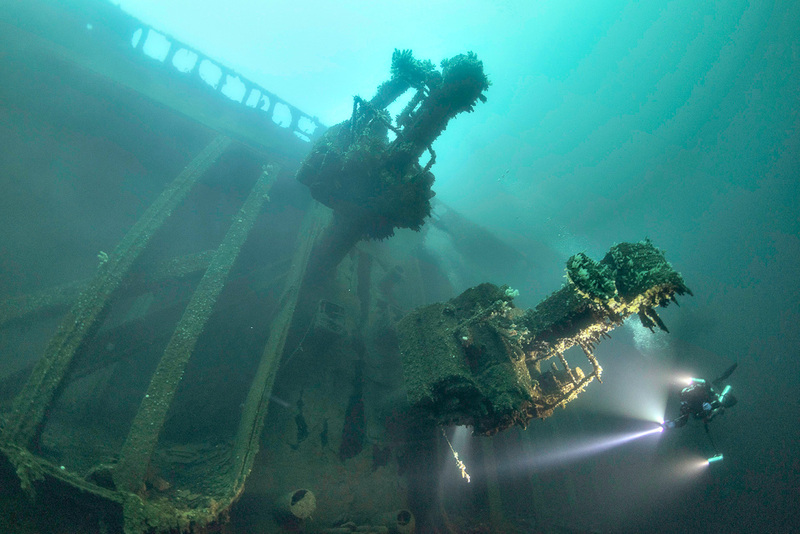 Starting from the bow, you will reach the port bridge wing at around 36 meters depth. In between, there are lots of exciting sights and If you go deeper at the forward part of the wreck, the huge cranes tower above you. Welheim lies on her port side at an 85° angle and the bow is at 14 meters. The twin propellers can be found at 70 meters. It was a modern ship for her age and she, therefore, didn’t have the huge masts and loading booms common on freighters built before WWII. She was also equipped with four huge cranes, fore and aft. The cranes are still standing on the deck, creating a beautiful silhouette.